Overhaul or Overthrow of Environment Legislations? Modi government’s take on Environment is not much different from UPA’s assessment. It’s an impediment to growth and FDI. Unless government of India commits itself to Ecocide, there is no option but to say by bye to double digit growth and to massive pouring in of global capital. Corporates, foreign and Indian, are waiting in the wings to see, if Modi can deliver, where UPA failed, the natural resources on the cheap and with little let or hindrance. For global capital to salivate at the prospects of ‘destination India’, the internal rate of return [IRR] for big-ticket projects has to climb to ‘healthy highs’ of double digits from below 7-10% it has been languishing for several years. Unless ecocide is accepted as the ‘inevitable’ sacrifice to the deity of growth and thereby the ‘wealth’ of natural resources is unlocked at basement rates, the $$$ shining in the eyes of global capital would be extinguished for ever. If that were to come to pass ever, it would be death blow to the savviest dream merchant of development India has ever seen. Before we see the story in Business Standard, who has accessed the report of 3 months old T S R Subramanian Panel, a brief look at similar shenanigans of the UPA. Gadgil committee had studied Western Ghats at length and concluded that it was an extensive, sensitive and crucial bio-diversity hotspot that also has major effect on the precipitation and water release [acts as a sponge] during the Monsoons, which is critical even today to agriculture [food security] and even water availability. 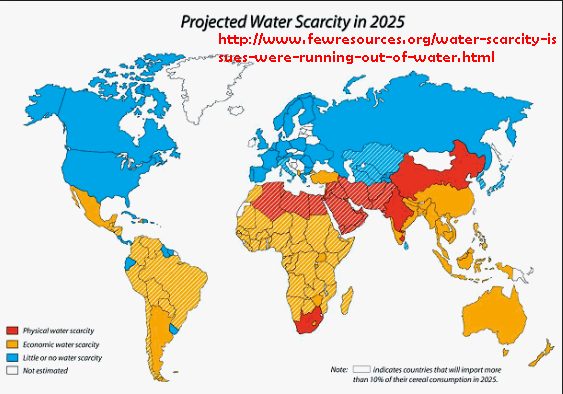 The Water Stress Map of the world [in 2025] by Few Resources Website puts India in the forefront among nations, who may face absolute water scarcity or shortage. Government and Industry hated the Gadgil Panel Report [GPR] and to sabotage its recommendations the job was handed over to ex-ISRO head –not an environmental scientist, K Kasturirangan. It is not the case that GPR is sacrosanct, but the manner and haste with which it was sought to be ‘buried’ without extensive consultations definitely smelled rotten. –GPR recommended that 94-97% of the Western Ghats should be considered Ecologically Sensitive Area (ESA) under the Environment Protection Act, 1976. It had put several restrictions on the projects that would damage the ecology of the Ghats. It had also mandated that Thehsil should be considered a unit, villagers should be consulted and their informed consent should be obtained before any project is started. 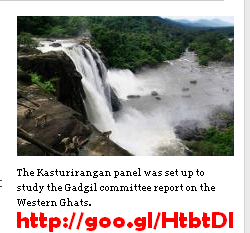 –KPR Panel whittled down the ESA to about 37% of the Western Ghats –about 22,000 square kilometres of forests alone. It shied away from defining extensively what constitutes ‘good development projects’ in each area and instead defined and prohibited what it considered activities with maximum interventionist and destructive impact on the ecosystem [Proscribing rather than prescriptive as with GPR]. What Nitin Sethi [@nit_set] reports in Business Standard, is an extensive hatchet job executed by T S R Subramanian Panel [SPR] quite obviously at the behest of the government in power now. Modi had shown his disdain for environment when his cabinet cleared several project at one go, often: In June, 7 project worth 21,000 Crores –one project languishing for 30 years or in August, 16 projects and National Board for Wildlife 133 proposals. UPA too tried the same trick earlier when it faced flak for lethargy and for being a lame duck government by clearing 36 projects worth 1.83 lakh crores at one go; but with little [positive] effect on Corporates. SPR’s ‘effort’ to break the back of environmental legislations is truly breath-taking. Here is a look at those recommendations that are problematic and have potential for great mischief. -National Green Tribunal [NGT] to be weakened, special district level courts to act on infringements of laws. ß [Delegation to a level, where expertise and competence to decide on issues would be inadequate or limited, scope for great variability in decisions and outcomes, and scope for administrative interference abundant]. -Infringement of laws to be ‘distinguished’ and ‘categorised’, and prosecution or arrests only in ‘serious offences’. ß [Deterrence would be reduced if offenders let off with light rap on the knuckles]. -System of ‘Self Certification’ based on ‘utmost good faith’ to allow project developers ‘voluntary disclosures’. ß [Past record of industry is disastrous, wilful neglect of laws would be the norm]. -No-Go areas for mining restricted to existing protected wildlife areas and forest patches with more than 70 per cent cover; and wildlife corridors, lands with high biodiversity value (regardless of forest cover) and lands that acted as catchment of rivers excluded. ß [Disruption of river basin flows, landslides, destruction of bio-diversity and choking of wildlife would explode]. –Forest Rights Act [FRA] and National Green Tribunal Act [NGTA] were not within the frame of reference or purview of the panel, yet recommendations given. ß [Clear case of overenthusiasm, willingness to please]. -All Linear Projects [Transport/Transmission] to override FRA. ß [Protection to most backward marginalised communities greatly weakened]. -Ministry to take over powers of the National Board for Wildlife (which has outside experts on board) in reviewing any changes to national parks and sanctuaries. ß [Excessive concentration of powers in the ministry, where views of industry like to prevail]. –Fast-track, single window mechanism for ‘Linear’, Mining and Power projects. ß [These are the very sectors that have proved most notorious for environment destruction]. Harbour no illusions, many of the changes were tweaked by the earlier UPA government itself. No wonder, after all the head of the panel was the cabinet secretary in the old regime. Its continuity of the Corporate friendly policies, only with great vigour and from position of strength. Corporates must be getting ready to laugh their way to the banks. Their investment in Modi government in the run up to the elections is going to see very handsome returns indeed.